Can Bone Broth Be Used as Part of a Zero Carb Diet? I have received a lot of flack in the Zero Carb community Zeroing in on Health (ZIOH) from many long time veterans of the Zero Carb diet who run that group. Now please, don’t get me wrong, I still love and appreciate much that this group has to offer, I just feel that their vehement opposition to me discussing bone both is a wee bit ridiculous. I mean, it is from the animal kingdom, right? So what exactly is the big deal? First, it is important to understand that – with one exception – none of these long term Zero Carb vets have ever made and consumed bone broth as part of their Zero Carb way of life. Their main concern is that people new to the Zeroing in on Health group who read glowing reports about bone broth by the likes of me will be misled into thinking that bone broth is necessary for long term health on a Zero Carb diet. However, if a person takes the time to read my very detailed description of The Zero Carb Diet, or the excellent FAQs document written by the ZIOH administration, then they won’t be the least bit confused. But unfortunately – as much as I would like to – I cannot make people read. Some folks just want 30-second sound bites and there is nothing I can do about that. I have actually been accused of saying that bone broth has “magical healing properties.” I certainly I have noted that it contains specific properties shown to help heal specific health problems. But I have never called it “magical.” It may have healing properties, but there is nothing magical about them. Rather, it is pure nutritional biochemistry, as you will discover if you decide to learn more about it. But, one could just as easily be misled into thinking that eggs are a necessary component of a Zero Carb diet since they are extolled almost every day by someone in the group. However, as The Andersen Family has clearly shown, eggs are definitely not necessary for long term health on a Zero Carb diet. They have been eating only ribeye steaks for almost 2 decades and are thriving. And, as many Zero Carb-ers have discovered through experimentation with their own bodies, eggs do not agree with or benefit everyone who follows a Zero Carb diet. The Andersen’s found that pretty much everything except fatty beef made them feel less than well. The only way that any of us can figure out what works best for our individual bodies is through trial and error. There is no one way or right way to do this diet. The basic Zero Carb Guidelines are to eat only from the animal kingdom, which is quite broad in certainly would include bone broth. If you wish to reduce the variables, many Zero Carb veterans recommend eating only meat (preferably beef) and water for the first 30 days. This way you will have a baseline from which to test other animal foods like dairy, eggs, and organ meets. I personally support this advice because people rarely react negatively to meat, especially beef. So, when a person first embarks upon a Zero Carb way of eating, the less variables the better generally speaking. 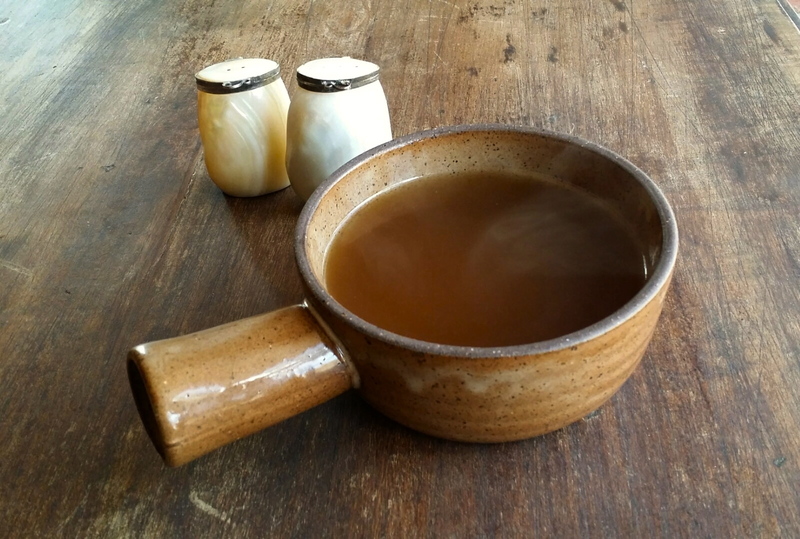 Bone broth is certainly a variable, and not everyone does well with it. In Nourishing Broth, Kaayla Daniel explains that some people who are sensitive to MSG have trouble with the high level of glutamine present in bone broth because the glutamine gets turned into glutamate and crosses the blood-brain barrier creating unpleasant cognitive symptoms. Glutamine sensitivity is most often experiences by children with Autism, Asperger’s, ADHD, etc. For the majority of people, however, this is not an issue, but it is certainly important to be aware of the possibility. Like anything else, you just have to try it and see how it makes you feel. After reading Daniels book devoted to the subject, I decided the potential benefits were well worth exploring. What I discovered is that I felt better when I included it in my diet. But again, this will not be true for everyone. I noticed very quickly that on the days I drank bone broth, I did not get leg or foot cramps that night while sleeping or the next day. While on the days that I did not drink it, I did. It was a very cause and effect correlation for me. Many Zero Carb vets have stated that they tried everything (salt, magnesium, bone broth) to try and prevent their muscles from cramping, but that none of these measures had any positive effect. And, yes, these are the same vets who have also stated that they “never have and never will” make and drink bone broth, so I am not to sure how many of them actually tried bone broth specifically to address the muscle cramps they were experiencing. I am, admittedly, a little confused by their contradictory statements. And even if they did try bone broth without experiencing any noticeable difference, then I would want to know how much bone broth they drank each day and for how long. If you are deficient in a mineral, it not only takes a certain amount of that mineral, but it often takes more than a day or two for the cells to get it where it needs to go. Muscle cramps are a very common experience in the initial weeks and months of a Zero Carb diet. One of the main symptoms of a potassium deficiency is muscle cramping. When a person first begins a Zero Carb diet, a lot of excess fluid is flushed from the body and a significant amount of potassium is lost in this process. I have explored this phenomenon more fully in my page on The Adaptation Process. There is nothing especially dangerous about this because it is self limiting. Once a person’s metabolism and kidneys make the transition from being a sugar burner to being a fat burner, you stop losing excess fluid and your mineral balance is restored. However, the interim period can be somewhat uncomfortable, and bone broth might help to ease the transition. As it happens, bone broth is an especially good source of potassium, especially if there is some meat attached to the bones. I generally use whole chicken and turkey parts, mostly because that is what is affordable. But any meaty bones can be used: pork , lamb, beef, and even fish. It has certainly made a noticeable difference for me personally. But, I also drink an average of 2 quarts of bone broth every day, so this may be why I found it to be an effective remedy for muscle cramps compared to those who did not. I also remove the fat from the broth after it has chilled and drink only the potassium-rich liquid. I do this so that the broth will not interfere with my appetite and so that I can drink more of it. It act like an sugar free electrolyte replacement beverage, i.e. Gatorade without the sugar. Interestingly, I have found that I do best drinking it on an empty stomach BEFORE a meal. If I eat it AFTER a meal, it will stop the meat in my stomach from digesting and I will be miserable for hours afterwards. I am not sure how it will affect you, but this is what I have learned about my own body. So you might want to pay attention to when you drink it and see if this makes a difference for you as well. Many Zero Carb vets have argued that making bone broth is time consuming and difficult, but I have not found this to be the case for me. I put the bones in my crock pot, add water, let cook for 12-48 hours, and then strain. It takes me all of about 15 minutes. This is a lot less time that these vets spent ridiculing bone broth and those of us who drink it in a recent ZIOH post that generated 700 comments and continued on non-stop for almost two days! Really? Yes, really. Okay, I will admit that the straining process is a bit messy, but that can easily be streamlined with the proper equipment. All in all, it is a small amount of work with a big pay off for me personally. Not only do I like the taste and the way it makes me feel, but the nutritional components present in bone broth are very beneficial for gut health. With the exception of Joe Andersen’s wife Charlene, none of the Zero Carb veterans I have interviewed had serious gastrointestinal issues like I do. Most came to the Zero Carb way of eating for the purpose of weight loss. Therefore, while I deeply respect their knowledge of this diet, I also recognize that I have health issues with which they have no personal experience. I have problems that they cannot possible understand because they have never lived in my body. And I know that I am not the only one in the group with these kinds of challenges. Many new people have joined the group and started the Zero Carb diet as a result of reading The Andersen Family interview after it was shared by William Davis on his Wheat Belly page and several other very popular sites. The people this interview has attracted are people with severe health problems like Charlene and myself, not people just looking to lose excess body fat. While bone broth is certainly not necessary to long term health and success on this diet, it also holds the potential of being very beneficial for some like me. The one veteran who does use bone broth on a semi-regular basis is Ana Teixeira. Ana is an Ultra-marathon runner with unique needs due to her almost superhuman physical activities. We are all different, and we don’t all have the same needs. I believe it is import for this reality to be acknowledged and accepted. This does not change the basic tenets of a Zero Carb diet: meat and water… meat and water… meat and water… meat and water. That is the most important principle of this way of eating to understand. Meat and water must form the foundation of a Zero Carb diet. Everything else must be seen as complimentary to that. In other words, one broth should not be used in place of meat any more than eggs or cheese should. I really hope the long time vets of Zeroing in on Health can find it in their hearts to be more supportive of people with unique needs, instead of dismissing and ridiculing us as we walk our Zero Carb path to well-being. It is sad and – quite frankly – bizarre that a group of people dedicated to this way of eating would engage in behavior that is both demeaning to individuals and divisive of the community as a whole. If you would like to read about some of the unique nutritional properties present in bone broth, please see my Bone Broth page. This entry was posted in Uncategorized and tagged Autoimmune, Bone Broth, Brain Fog, Broth, CFIDS, CFS, Chronic Fatigue Syndrome, Diet, Disease, Eskimos, Fat, Gastrointestinal, Health, High Fat, Illness, Keto, Keto-Adapted, Ketogenic Diet, LCHF, Low Carb, Lyme, Lyme Disease, Meat, Nutritional Ketosis, Paleo, Paleolithic, Primal, Soup Stock, Stefansson, Stock, Weight Loss, Zero Carb by esmeelafleur. Bookmark the permalink. Thanks for posting this. I felt the same way about how the bone broth issue was handled. It feels like it was a heavy handed way of dealing with the issue. Actually the issue was the rigidness of the moderators’ thinking. Can we say “dogma” here? I for myself still drink bone broth and have been for around a year. It has helped heal my leaky gut and my skin and fingernails. Although I’m kinda getting tired of using pig’s feet! I will try other bones and do without the carrots and celery and see how it tastes. I had been only in the group for a few days and was seriously thinking that I made a mistake after reading the exchanges between the moderators and members. Hi there. Thanks for bringing this up. I am only on Day 8 of ZC lifestyle and I am having cramps. Do you put salt and pepper in your bone broth? I used to make bone broth with onions, celery and any other vegetable I have in the fridge, but is salt and pepper acceptable? I use salt, but no pepper. I explain this in my page on Adaptation which I linked to this article. You may also wish to read my page on Salt which further explores is use in the initial stage of the Zero Carb diet. You re more than welcome to use any spice you wish, as long as they do not cause cravings. I do not use any because all spices contain Salicylates which I am sensitive to. You can read my Salicylates page if you wish to learn more about this. Thank you for your questions. First time I ever said “glad I’m not on Facebook”…..it just brings out the ugly and ignorance of humans. As far as bone broth, I’m glad you mentioned it Esnee as others maybe benefit from trying it. I personally saw no difference when I tried it, but like you said, it could be that I didn’t have the amount you did. For me magnesium supplements work fine for my leg muscle cramps. I’m sure others will agree with you that bone broth does wonders for them. Don’t fret about others opinions though… there are way more peeps that love and support you than those that don’t! Please keep chin up continue on the merry meaty way! Thank you for this wonderful site and community! What are your thoughts on using an Instapot (pressure cooker) to make bone broth? I’ve made mine in slow cooker and also ordered from US Wellness Meats. I have yet to use my Instapot but hear you can make broth in 45 mins. I use my pressure cooker sometimes when I was it faster. I usually let it cook for 2 hours. It works well for chicken and turkey. I have a Kuhn Rikon. Thank you so much for taking the time to comment and share you experience. I am delighted to hear that you have found a way to make an meat-based diet work for you. Please feel free to join us in The new Zero Carb Facebook group Principia Carnivora where all discussions about this way of eating are welcome. That’s what screwed me up. Well, maybe not totally. But I was on broth, but then off. I was getting mixed signals. I even stopped all my meds while trying ZC. I wanted to be doing it pure. I was confused. I didn’t realize I was getting unified instructions. I relate too much now with people with complicated health and/or solutions. I was not taking my prescribed potassium and allipurinal and I paid the price. I’m sticking here. Thanks. And thanks for t h e patience and inclusiveness. Keep educating the masses, Esmee. Love ya! Thanks for this post. I have been ZC on and off for a couple of years, but several months ago I became fully convinced that this is the only diet for me, forever. I have been sick with multiple autoimmune issues for ten years, as well as dysbiosis, leaky gut, SIBO, and malnutrition due to malabsorption. In the last year I have experienced some extreme neurological symptoms linked to B12 deficiency due to the gut issues. I may never completely heal and must do everything I can to get as much nutrition as possible. It is so reassuring to hear stories of healing, not just weight loss. Broth is part of my daily diet and healing plan. I was so confused when I read some of the negative comments on FB, but now it is clear that it really has nothing to do with zero carb, an all animal diet, or nutrition. I, too, use my croc pot to make bone broth. Once you have a system, it takes little time or effort. Compared to making a “typical” meal with carbs, veggies, sauces, etc. it seems super easy. I would recommend it for anyone with special healing needs, or a just a desire for a change of pace or warm drink other than water. If this is how some people respond to animal bones and water, I can only imagine what they must think about people who drink coffee or tea. I’m glad someone else besides me has issues with ZIOH Facebook. Lol. I feel there’s a lot of double standards and nobody is free to discuss or challenge the status quo. I left after trying to have a civil discussion about weight and how it’s being promoted to our children. I wasn’t for the new Sports Illustrated model that’s heavier. I’m not for anorexics either being promoted but I’m apparently a “cereal pushing mama” just because I didn’t think that the heavy girl should be receiving accolades and put in SI. A lot of heavier ZIOH people were offended cause they looked like her while eating ZC. But the funny thing is, their mantra is “Once you heal, you’ll lose the weight” so obviously they’re still healing so why take offense? No one is holding them up as perfect pictures of health to the entire world, you know? Your size is your size but I think promoting being overweight for health is just as ridiculous as promoting underweight models. And don’t tell me that overweight people are the new healthy cause people in the 50s were healthy and they weren’t overweight. They weren’t ZC but they did better than most Americans on SAD. They home cooked their meals, ate reasonable portions, etc. I thought I was alone in feeling this way — it’s kind of a, shall we say, tough crowd?! I’m still there, but I’m lurking, not posting — I introduced myself and asked some harmless starting-out questions, and I was basically politely told to “shut up until you’re 100% in.” Um…okay? Totally scared me away and left a bad taste in my mouth, no pun intended. Anyway, I’m just taking what sounds right and leaving the rest. I also joined PC and I’m really looking forward to those posts! Back to bone broth…muscle cramps is one issue that has me scared to jump in completely, but I’m definitely going to try this. Such great research and knowledge here…thanks, Esmée! Anyone who lives in NYC and wants to try some genuine bone broth before deciding if they want to get into it themselves, Brodo is very passionate about what they do. Not a fan of all the addons they offer but business is business. I get the plain beef broth and it is quite good. Hope this isn’t seen as some sort of malicious advertising attempt! The New York Times did a good write up on Brodo a few years ago. Sounds like a nice place.